There are people who love tofu, people who absolutely hate tofu, and people who say they hate tofu but have really only tried it one way, and if they just ate it roasted or sautéed with a flavourful marinade and seasonings then they would probably change their mind. I fall somewhere between the second or third category – I’ve always strongly maintained that I hate tofu, and though I admit I haven’t tried every preparation of it, I have tried it at least a couple of times and just can’t get past the texture. I’m a big texture person – I hate crab, lobster, and shrimp, for example, not because of the taste but because of that horrible texture that I can only describe as rubbery (I’m getting grossed out right now just thinking about it!). So I don’t just discriminate against tofu, I discriminate against textures! Now moving on to something I love, I cannot get enough of fresh summer corn lately. I can eat a whole bowl of corn kernels with a bit of salt and pepper as a snack and be the happiest girl in the world, and I love incorporating corn into my dinners too. Lately I’ve been seeing a lot of corn dip recipes around the web that look amazing, but are often loaded with cheese or cream or other not-so-light ingredients, and since I’m usually the only one eating whatever I make, I didn’t like the idea of having to eat that all by myself. 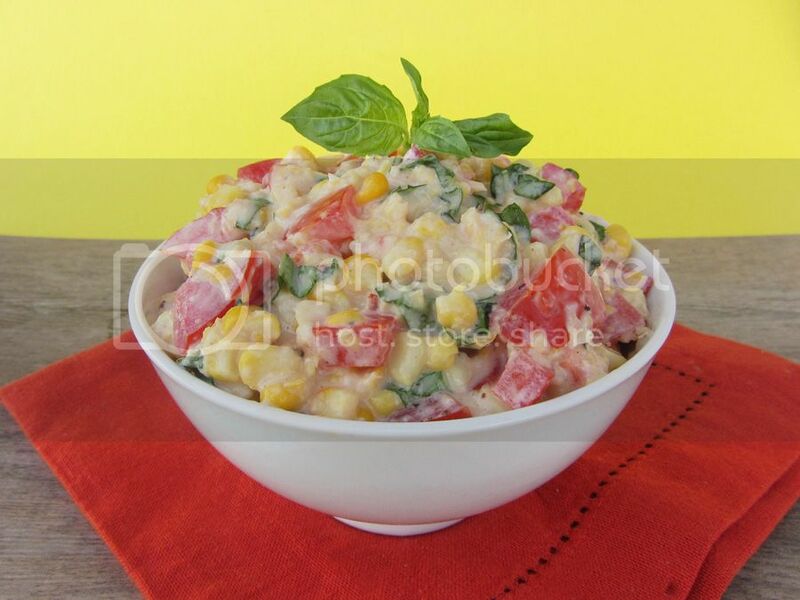 So I was intrigued when I saw a lighter, fresher corn dip recipe on Whole Living, with tomatoes, basil, and … you guessed it - tofu! So it was a battle between my love for corn and my hatred for tofu – which would win out? Well as you already know, my need for corn dip in my life was stronger, and I convinced myself that maybe silken tofu isn’t as bad as regular tofu, and maybe when it’s mixed into a dip I wouldn’t notice it, and maybe if I added a little goat cheese to the tofu then it would mask any “tofu-y” taste. And it turns out that every one of those assumptions was right! The tofu added creaminess to the dip in a way that made it light and fluffy, but I didn’t taste the tofu one bit! 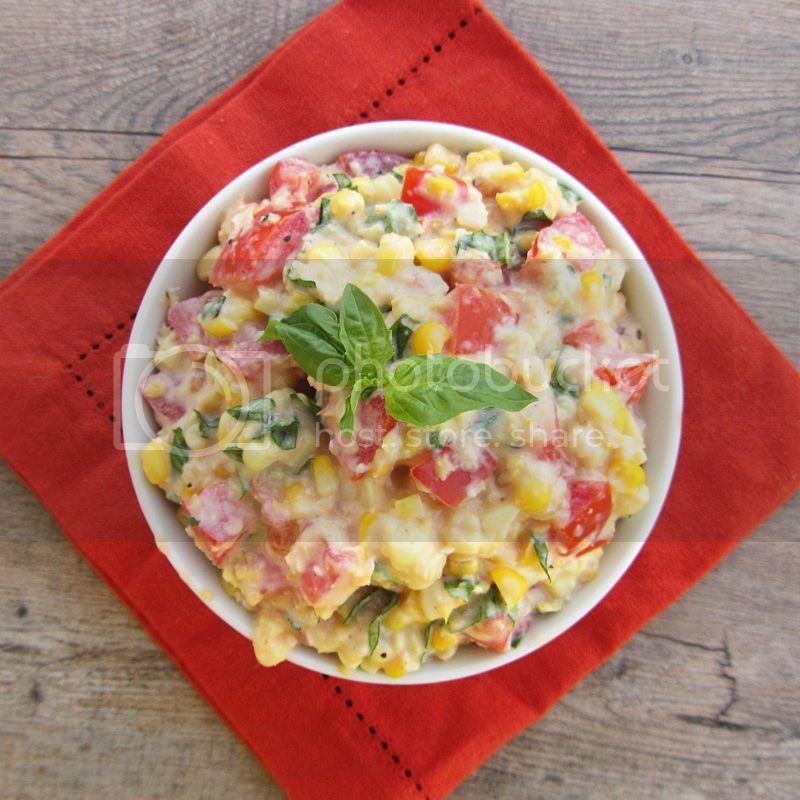 All I tasted was summer in a bowl – the fresh flavours of corn, tomato, and basil, with a bit of tang from the goat cheese and lime juice that helped to cut the sweetness of the corn. One bite and I was in love with this dip. 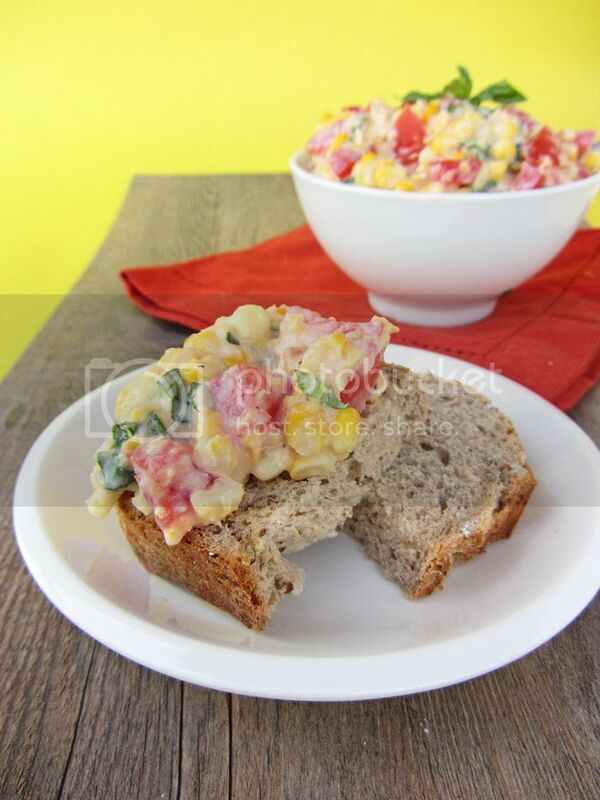 I ate it with tortilla chips and spread it on slices of hearty multigrain bread and both ways were delicious! This makes a fantastic summer appetizer, and you don’t even need to tell anyone there’s tofu in it because they won’t know! And while I’m not sure this converted me to a tofu-lover, I’m definitely intrigued with the idea of sneaking tofu into things in ways that I won’t notice it! In fact, I’ve already tried a second recipe to use up the rest of my silken tofu and I loved it too, so give this one a try so you can get excited about the second recipe coming soon! 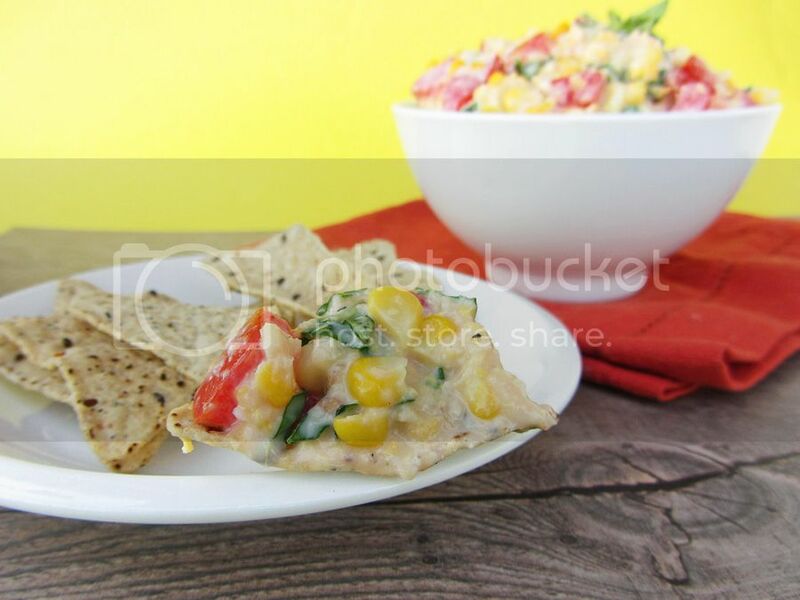 Fresh Corn Dip with Tomatoes, Basil, and Tofu! Cut the kernels off your ears of corn into a large bowl, and rub the back of a large knife along the cobs to extract the corn milk. Heat 1/3 cup milk in a large skillet over medium-high heat and add the corn. Cook for 7-9 minutes, stirring occasionally, until corn is tender and most of the milk has been absorbed. Let cool. Add 2/3 cup of the cooked corn to a food processor along with the tofu, goat cheese, and lime juice. Process until smooth, and add salt and pepper to taste. Transfer to a serving bowl and stir in the remaining corn, tomato, and basil. Taste and adjust seasoning if necessary. Serve with tortilla chips or on bread. Good for you for giving tofu a chance...now you've used silken tofu more than I ever have! 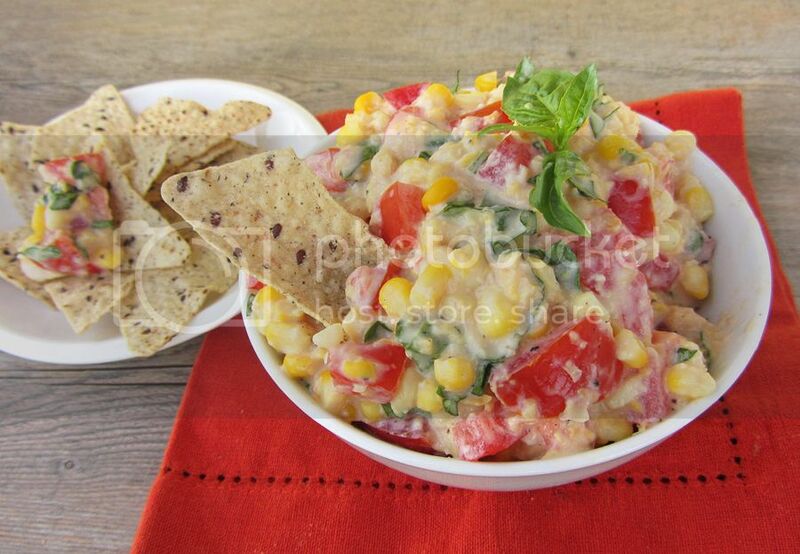 This dip was really good, even I was surprised - it helps to have peak season corn, it was so sweet! I've always assumed I don't like tofu...but also never really eaten it :) This looks great, I love fresh sweet corn! I fall safely into the tofu LOVE camp but I'm weird about textures of foods also. I've never been able to do shrimp, lobster or calamari. Gross. I think it's impossible to go wrong with fresh corn! That's my goal, to not mind it so I can eat it in certain dishes if I have to, but I don't expect to ever love it (in dishes where I can taste it)! Trying it in a dish like this where it's mostly hidden would be a great place to start! Completely agree about those three things .. except for calamari which I've never actually tried, but I just know I won't like it! Haha well if you make it too I hope you like it as much as I did!